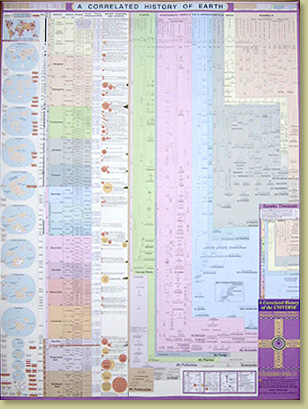 A Correlated History of Earth is a full-color educational wallchart documenting 4.5 billion years of Earth's past as never before. Each column is a correlated timeline from ancient times to recent. Included are plate tectonic maps, mountain building events (orogenies), major volcanic episodes, glacial epochs, all known craters from asteroid and comet impacts, over 100 classic fossil localities from around the world, fossil ranges of plants, invertebrates and vertebrate lifeforms, and major extinction events as revealed by the fossil record. Also evident on this chart are the Cambrian "explosion" of animal phyla and the juxtaposition of reptiles and mammals across the Cretaceous/Tertiary(K/T) boundary. Hundreds of illustrations add a striking visual dimension to the data. Image shown is of an earlier edition. Extras Ships rolled in tube.